Millions of birds are, at this very moment, engaged in the world's most astounding mass movement. Powered only by their own brawn, love-handles (or fat, which in the bird world is of life-and-death caliber of importance), and self-will, these birds are driving southward, come what may. Imagine the entire northern hemisphere alive with fluttering wings, slowly drifting southward across mountain tops, across wide valleys and deserts, across lakes and vast stretches of ocean. More than anyone can count, and more than anyone can imagine. Many will stop in Mexico, central Africa, India, but many will continue further, to central and south America, to southern Africa, to Australia and New Zealand. There is one bird, however, that outdoes all others...the Arctic tern. Traveling about 49,700 miles every year, the Arctic tern (which only weighs 100 grams or about 1/4 lb) wings from the Arctic all the way to Antarctica, truly bipolar organisms. This is a phenomenal feat. It is this bird that I will think of as I undergo my own south-bound migration. There are a few similarities: they are going to Antarctica for the summer (our winter), I'm going to Antarctica for the summer...they weigh next to nothing, I weigh next to nothing...but that's about where the similarities end. I'm going almost 10,000 miles and will hardly be moving a muscle to do so (except running to my next flight...good thing they make those flat moving walkways, otherwise I would have to use my muscles even more). Although I should put on fat (to stay warm! ), I don't have to because I don't have to use my own energy reserves to power my body down there (good thing they make those massive, fuel-powered, flying sardine cans for us to ride inside of). Thus said, my feat is not nearly as phenomenal. Funded by the National Science Foundation, our small crew (7 or 8?) 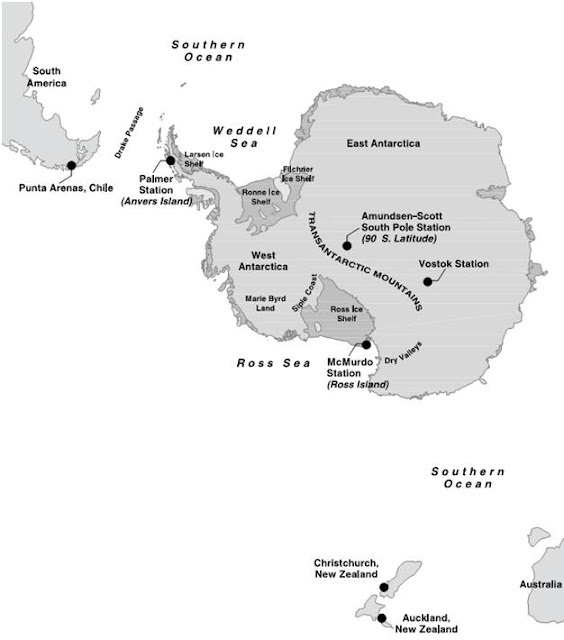 will be headed to the US station McMurdo, a town of about 1,100 people in the summer (see map below). We will be collecting data pertinent to the study of population dynamics of Weddell seals operated by my professor and friend from Montana State University, Robert Garrott, whom I also worked for in Yellowstone last winter. I am still in disbelief that I am headed to Antarctica; it is something that I never even contemplated dreaming about because, sheesh, it is just so unrealistic of a thing...no one gets to go to Antarctica! But, here I am, half-packed, trying to imagine all I need to survive down there. I keep telling myself that if I can survive a winter in Yellowstone, I can survive a summer in Antarctica too (supposedly, Yellowstone gets just as cold). I leave from Idaho Falls on Sept 26th, and will arrive in Christchurch, NZ on Sept 28. A few days later, we will clamber into a C-130 and try to beat the Arctic tern to Antarctica. The next blog post will come directly from Antarctica right to your face for your viewing and reading pleasure. Beat that Mr. Arctic tern. By now you are in another world - metaphorically speaking. Looking forward to your posts. Loved the comparison of your migration & the arctic tern's.